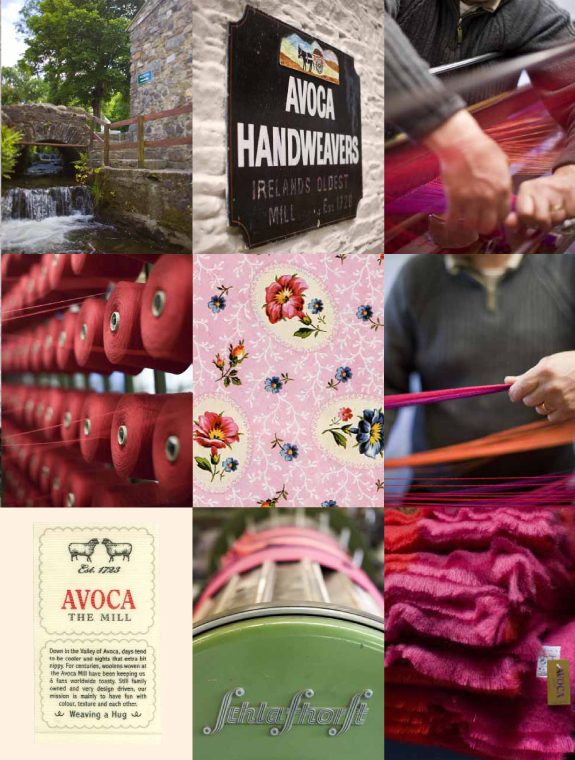 Avoca Handweavers – a wonderful sale yesterday! Yesterday Alan came with me for a drive to the beautifully sited Avoca Handweavers in the picturesque village of Avoca, Co. Wicklow, the small country village where the popular television series Ballykissangel was filmed. Once a year Avoca Handweavers have a monsterous sale of buttons, handwoven fabric, odd cones of yarn and a selection of odds and ends of scarves and rugs. For some reason WordPress is playing up this afternoon and won’t allow me to insert Avoca as a live hyperlink but if you want to check out about the business the website is www.avoca.ie/ and the information about the woolen mill that I actually visited can be found when you click on the section about the history of the company. Basically this is the location where most of the weaving is done (as opposed their main retail outlets dotted all over Ireland) so in addition to the working section some outbuildings have been transformed into a shop to showcase their finished products and there is also a super restaurant/coffee shop filled with the most yummy savoury foods and cookies. The materials, findings and yarn are only on sale to the public once a year and the prices are AMAZING!!!!! I scored the most incredible pure wool tweed in a fantastic check colour scheme, incredible value so I obviously just HAD to buy whatever was left on the bolt, 6 1/2 metres @ 5 Euro per metre! There was also about 3/4 metre which had been damaged in a couple of spots and I was able to get that for 1 Euro, the width is so great that I will have plenty to play around with for felting or use to line a bag, I suspect it will melt into fibre like butter if felted. My intention is to make (or have made if I could afford to!) curtains, cushions and a bed spread for my main guest room, I think the modern design of the tweed will really update and show off the traditional style of my farmhouse! I also bought 3 metres of a stunning printed fabric which we thought was a very fine silk chiffon, 141 big funky buttons in various styles (10 cent each), a handfull of colourful zips (in case I ever get into the swing of sewing!) and 26 D rings which I hope to use for some new felt belts as well as an adjustable shoulder strap for a new style of bag I am planning. I also met up with some of the ‘Wicklow Knitters’ group on Ravelry, hi girls, how brilliant the internet is for bringing like minded people together, amazing! All in all it was an brilliant day, Alan bought me a gorgeous cream jacket for Valentine’s Day (and I might have bought him something but that is a secret until tomorrow night), it’s too dark now to take any pictures but providing the weather is good in the morning I will be out with the camera and give you a taste of the style Avoca has to offer. This entry was posted in Felt and tagged Avoca Handweavers, Avoca woolen mill, buttons, Clasheen, Felt, tweed, wool, yarn by Nicola. Bookmark the permalink. Yes it was a great day out and lovely to see you. Am curious (i.e. nosey) about the jacket. What a nice gift. Photos please! Wow! I’d say that you hit the jackpot of wonderful finds and at such amazing prices! I’d look forward to a day like that all year long.